The Northwatch Prisoners can be found in the northeastern part of Northwatch Keep. All three are locked inside separate cells and merely function as supposed cell mates when Thorald Gray-Mane spawns in the interrogation chamber as part of the related quest. All three prisoners wear simple clothing, a roughspun tunic with a pair of footwraps. 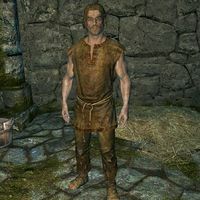 This Nord farmer can be found in the northwestern cell. Upon opening his cell and communicating with him, he only says: "I've got to get out of here! ", but makes no attempt to leave. 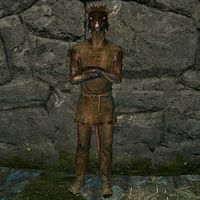 This male Argonian can be found in the northeastern cell, leaning against the wall. Upon entering, all he will say is: "What are you looking at? ", but will not move an inch. This female Breton is located in the southwestern cell, where she will be asleep around the clock. When her cell door is unlocked and you attempt to talk to her, she will wake up and utter: "Leave me alone.". None of the prisoners will attempt to escape from captivity, even if the dungeon is cleared and the cell doors are unlocked. This issue has been addressed by version 1.2 of the Unofficial Skyrim Patch; the prisoners now flee once rescued.